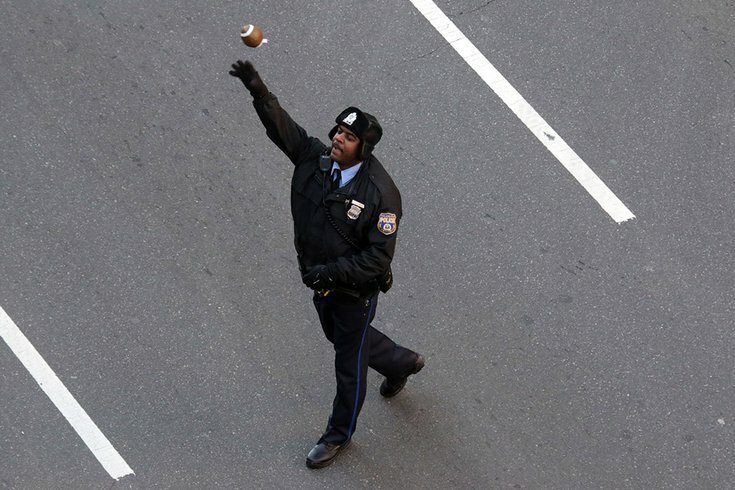 A Philadelphia police officer throws a football to fans waiting along Broad Street for the start of the Philadelphia Eagles parade on Thursday morning. Philadelphia police don't exactly get the most positive attention from the public or the media. Some criticisms are for good reason, sure. But I'd hate to think that even their harshest of critics couldn't extend plaudits for the way they handled the crowds at Thursday's Eagles victory celebration. That said, here are five videos of Philadelphia officers dancing, having catches and hyping the crowd along the parade route. These serve as proof positive that the joyousness was contagious. Good job, men and women in blue. Your celebratory spirit is much appreciated.